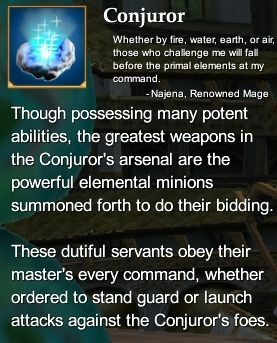 The Conjuror suits those who wish to summon powerful minions to perform their bidding in combat. The Conjuror's minion can be a creature native to Norrath or a manifestation of an elemental force. The Conjuror works best behind the frontlines of combat, directing his minion and wielding arcane elemental spells. These spells can strike down opponents or weaken their abilities. Conjuror Epic Weapon Series (80) - Rise of Kunark Conjuror Epic Weapon. This page last modified 2011-08-25 22:54:27.